Is LS9 the End of Performance as we Know it? This is a relatively small, M90 5th Gen Eaton used in some GM front drive V6 engines, but its general layout and design is typical of all modified Roots-type blowers. You say that, after reading our LS9 article, you can't get enough techie banter about blowers? Well, we can fix ya right up. We did a phone interview with Mike Sitar, Development Manager on the TVS supercharger project at Eaton and covered a variety of juicy technical subjects. The term "supercharger" is quite descriptive. Inside normally-aspirated or "atmospheric" engines, when the intake valve opens, downward movement of the piston creates lower pressure and the difference between that and atmospheric pressure causes air to flow into or "charge" the cylinder. In fact, automotive engineers describe what flows into the cylinder as "charge air". If we increase the intake manifold pressure above atmospheric such that the pressure differential between it and inside the cylinder is greater, a larger mass of air will flow into the cylinder than could by atmospheric pressure, alone; we'd be "super" charging the cylinders so, when an engine is "supercharged"; there's usually some external device increasing the mass of, or compressing, the charge air going into the engine. Of course, with that extra air, we can burn more fuel and the result is more power-of which we can never get enough, right? How much compression occurs is sometimes expressed in pounds-per-square-inch (psi) above atmospheric pressure and is called "boost", i.e. 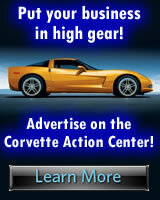 : "10.5 pounds boost" pressurizes the engine's intake tract 10.5 psi above atmospheric. Roots superchargers come in all sizes, small, large and...really big, like this Gibson-Miller Mk.II Supercharger being serviced by NHRA Top Fuel driver, Troy Buff. 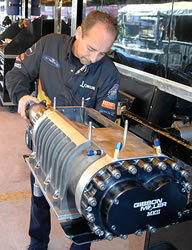 This blower is manufactured by Bill Miller Engineering, Ltd. for drag racing use on Top Fuel and Funny Car classes. There are several types of superchargers: "Roots", "Modified-Roots", "Lysholm screw", "centrifugal" and "axial-flow", all of which are engine-driven, and "turbo-supercharger" in which exhaust gas flow spins a turbine joined to the impeller of a centrifugal supercharger. For this briefing, we're concerned with the Modified Roots because the Eaton TVS R2300 used on the LS9 is that type. A common, but perhaps more correct, term for a Roots supercharger is "blower". One defining characteristic of both the Roots and modified Roots designs is that charge air compression occurs outside the supercharger, in the space between it and the intake valves. In effect, it blows air into the intake manifold where it becomes compressed due to the supercharger pushing more air in than can flow out. The Roots blower was patented in 1860 by two brothers, Philander and Francis Roots, as a ventilating device for blast furnaces, grain elevators and coal mines. In the last half of the 19th century they were quite common in those applications and that ancestry is key to understanding that a Roots is a device which moves air rather than compresses it. In the early part of the 20th Century, engineers perfected supercharging in motorsports and aircraft applications using primarily centrifugal superchargers. In the '30s, Roots blowers gained acceptance in Grand Prix and Indianapolis racing and on some expensive, high-performance sports cars of the period. Starting in the late-'30s, General Motors began using large Roots superchargers on the diesel engines it built for its GMC heavy-duty trucks, its marine engines and its Electromotive Division railroad locomotives. In the 1950s, drag racers and Bonneville Salt Flats competitors adapted GMC blowers to their racing engines. 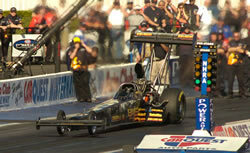 Today, Roots-type superchargers are still quite common in motorsports, especially drag racing. Traditional Roots blowers are typified by two-lobe rotors having little or no helix angle and by a vertical flow path, i.e. : the air goes in at the top and comes out at the bottom of the supercharger case. 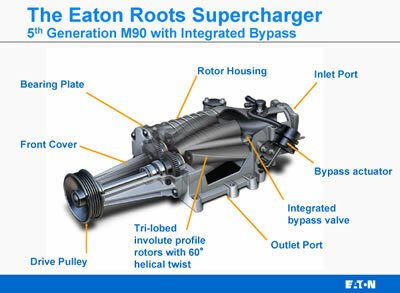 In 1984, the Eaton Corporation, which had been doing Roots supercharger research on-and-off since the 1950s, began a full-scale development program with the goal of introducing a Roots blower for original equipment (O.E.) 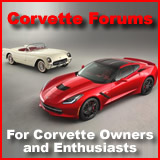 automotive use on some performance cars, luxury sedans and trucks. Eaton's so-called "Modified" Roots configuration uses three or four-lobe rotors with a significant helix angle. It uses an axial air intake at the front or the rear of the blower case and a top or bottom exhaust port. The first application of the Eaton Supercharger was the 1989 Ford Thunderbird Super Coupe. Since then it's been used in over 30 different O.E. applications. Chevrolet, Cadillac, Buick, Pontiac, Ford, Lincoln, Jaguar and Mercedes Benz are just a few brands which have used or are using the Eaton blower, the design of which was recently released in a significantly, upgraded, sixth-generation version. What actually moves the air through an Eaton TVS blower is a pair of contrarotating, four-lobe rotors which mesh as they turn. A Roots is a four-cycle device. The first cycle is "expansion" which takes place just as the rotors are un-meshing and also begin to uncover the inlet port. A very short duration low pressure is created which helps start the flow of air through the supercharger inlet. The second part is the "seal" or "dwell" cycle where the rotor cavity has been filled, the intake port is closed off by the turning rotors and the just filled cavity is moving from the inlet to towards the outlet. The third part is called "backflow" and is where the rotor cavity has just been exposed to the intake tract. The higher pressure there causes air to momentarily flow back into the supercharger. The cycle ends with "discharge" where the charge of air, now at intake manifold pressure, carried by the rotor mesh is forced into the intake tract. If the engine is not consuming air as fast as the supercharger can supply it, the mass of air in the intake manifold increases over what it would be if the supercharger were not present and its pressure increases. The more air flows into the engine and the more power the engine produces. Eaton's new TVS series blower family builds on the success of the Gen 5 series. While the unit shown is a smaller, rear inlet model, its major parts are typical of all the TVS blowers, including the R2300 front-inlet used on the LS9. These diagrams were drawn of Gen 5 supercharger but all modified Roots blowers cycle in a similar manner. These phase diagrams tell an important story about the performance of the Eaton Gen 5 compared to that of the TVS. Supercharger engineers often talk about "isentropic efficiency" when they are quantifying how effective the blower is. To derive isentropic efficiency, the supercharger's energy consumption is compared with the energy consumption of an ideal compression process resulting in the same airflow and pressure ratio. If ideal compression could occur, it would be "adiabatic", meaning no heat is transferred to the air being compressed other than adiabatic heating resulting from the compression itself and it would be "reversible", meaning the system and its surroundings would be the same after each cycle. An adiabatic, reversible compression is also known as an "isentropic" process. Isentropic compression is possible only in a perfect world, but it makes a great standard by which to compare superchargers. If ideal isentropic efficiency is quantified by 1.0 or 100%, then actual superchargers will be some magnitude less than that, such as .70 or 70%. One big factor in the LS9's R2300 being quiet, having a low input power requirement yet also being capable of high air flow and boost pressure, is the increased isentropic efficiency of the Eaton TVS design compared to previous, Gen 5 unit. 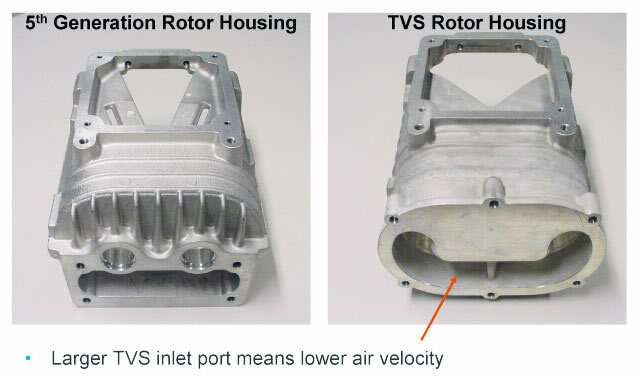 A contributor to that enhanced isentropic efficiency is the dramatic, 100° increase in the helix angle of a TVS rotor set over the previous generation's 60° "It was done primarily for inlet expansion inside the supercharger," Mike Sitar told the CAC. "The (Gen 5) rotor cavity grows with the 60° twist from the inlet port to the front of the supercharger. Each chamber expands to its maximum in 60° of rotation. That's controlled by the twist or the helix angle of the rotor. At higher speeds, we are creating a pretty large pressure drop in that rotor cavity because it grows faster than the air could fill it due to the air having to flow the length of the supercharger. "We looked at the actual speed of the air entering the supercharger and then looked the speed it had to attain to fill the rotors much faster. We'd run into choked flow and choke flow, of course, is a completely irreversible process. Even though you pulled the pressure down to a low value and it came back up from filling, there was an amount of energy which was lost entirely through that process. Changing the helix angle, slowed the rate of growth of the control volume and allowed us to almost match the speed of the air at the inlet vs. the air filling the unit. Executive summary: the larger helix angle slows the expansion inside the blower to a point where the air can more easily fill it. Another feature of the Eaton supercharger some find curious is the end or "axial" inlet. We asked Eaton's Mike Sitar to explain why that feature works so well. "If you look at the blower on a Top Fuel dragster, we call that a 'flow-through blower' because it has a radial inlet and a radial outlet. The issue we run into with a radial inlet is that you're working against yourself at the inlet port. The air is trying to enter a set of rotors which are spinning against the flow. As the center of the rotor is opening up, it's also going against the direction of the airflow. It's moving towards the center of the supercharger. Once it makes it through 90 degrees of rotation, then it starts heading back the other direction (down, towards the center of the supercharger). Half the width of the rapidly spinning rotors trying to push or "throw" the air back out of the supercharger is a deficiency of a traditional, flow-through Roots. In the coverage of the R2300 in the main LS9 article, pulsations and how they cause noise and heating at the blower outlet are discussed. The problem with air flow making rapid changes in velocity or direction is, also, present at the inlet of a flow-through Roots and causes similar increases in noise, charge air heating and inefficiencies. Of course, the noise from a Top Fuel dragster's Gibson-Miller Mk II Supercharger is hardly a problem when compared to the exhaust noise from the 8000-hp, nitro-methane-burning Hemi to which its attached. As for efficiency, while there might be an advantage in an axial-inlet blower for nitro-fueled engines, current rules drag racing sanctioning bodies apply to Top Fuel and Funny Car classes prohibit such a supercharger. Additionally, current state-of-art for that kind of supercharger has the overall design compensating, to a certain extent, for the inefficiencies at the inlet, i.e. : as inefficient as the nitro-class blower might be, it still flows a whole freakin' lot of air to feed an engine making 8000-hp. "The reason we run the axial inlet port is to get away from the centrifugal effect of the rotors opening against the inlet," Sitar continued. "Axial inlet is the first step in getting significant efficiency improvements from a Roots type device. Admittedly, it, also, causes problems with airflow and the ability to fill through a smaller (inlet) port, but we can address those issues in other ways, such as some of the features of the TVS design." At right is the Gen 5 inlet and at left is the TVS inlet. Big difference. Both these Eaton blower cases have rear inlets but the size of the opening in the R2300, front-inlet case is proportionally the same. The key parts of this graphic are the closeness of the solid and dotted lines. The 5th gen Eaton (in blue) has rotor mesh speeds and inlet air speeds that are far apart. The TVS' mesh and air speeds are much closer. That makes for higher isentropic efficiency.. Think the people covering their ears in the background care about supercharger noise? We doubt it. 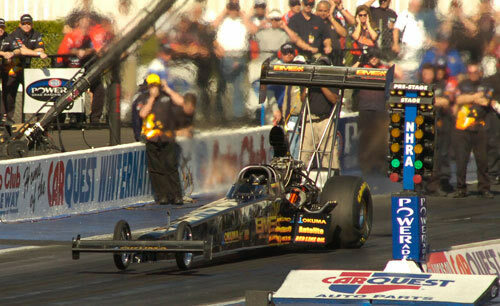 Roots blowers used on Top Fuel dragsters don't have to meet any of the pleasability goals that Eaton has to meet with its TVS superchargers. When most people discuss superchargers, they talk about boost which is the difference between atmospheric and manifold absolute pressure (MAP). For example: if sea level pressure on a standard day is 14.69 psi and the MAP inside the engine of your '09 ZR1 is 25.15 psi, then the blower boost is 10.5 psi. The problem with "boost" is that, while it's useful in marketing superchargers, for bragging rights and does offer a simple way to quantify a blower's performance, a more accurate benchmark, and the way most supercharger engineers quantify efficiency, is "pressure ratio" which is a measure not skewed by atmospheric conditions or mechanical constraints in the system such as intake restriction. "Pressure ratio is, quite simply, the ratio of inlet pressure to outlet pressure," Mike Sitar told us. "'Boost' is normally referenced to atmosphere. 'Pressure ratio' is more of a technical term because it's the pressure increase that the supercharger is actually providing between its inlet and outlet. It's the actual amount of work the supercharger is doing to the air. "Generally, the inlet of the supercharger is lower than atmospheric pressure, which makes the pressure ratio slightly higher (than the boost figure would indicate). "To derive pressure ratio, take the pressure at the outlet, add it to the pressure at the inlet, then divide it by the atmospheric pressure." An important advantage of the Eaton TVS family compared to the previous Gen 5 is its wider operating range. It makes more boost, er--has a higher pressure ratio--at lower speeds as well as at higher speeds. Most of our efficiency gains are with the inlet event," Sitar continued. "The helix angle change allowed us to change the porting of the housing. While we slow down the air filling the rotor cavity, the inlet port has, also, nearly doubled in size, compared to fifth generation. The slow down of the air--a low pressure differential inside the supercharger--has improved isentropic efficiency, by a significant amount. Add to that a much larger inlet port and we get higher flow through the supercharger at higher speeds. With the M122 supercharger, maximum speed was 14,000 rpm at 2.0 (maximum) pressure ratio, because it was at that point the outlet temperature would hit 150°C (300°F). That temperature constraint was primarily based on clearances within the supercharger. Supercharger engineers refer to isentropic efficiency maps in comparing superchargers. This is the map for the M122 Gen-5 Eaton blower. This is the map for the R1900 TVS supercharger. The R1900 is shown because it is closest in size to the M122. With the TVS, sixth-generation supercharger isentropic efficiency improved dramatically. Also, our volumetric efficiency at high speed has improved. This allows us to run to our maximum speed, which, with the larger units is limited, now, by bearings, of 18,000 rpm and a pressure ratio of 2.4. Even at that speed and pressure ratio, we never hit the 150 C outlet temperature." A supercharger that flows more air, heats it less, is more quiet and is a smaller size? Seems like the folks at Eaton have all the bases covered. Works for us.